Keep Your Head & Standards High – Be You. Be Great. When you consciously set standards for your life, whether it be how you expect to be treated, how you expect to treat others, where you live, the quality of the food you eat, or the quality of relationship you are willing to settle for, you are deciding on what meets and exceeds your highest standards and what does and doesn’t meet your lowest standards. These standards are reflected in the promises you keep, your values, the quality of your work, the fashion of your clothing, your weight, your health and fitness, and your finances. In reality, everything you do reveals the personal standards you live by. By setting your standards and living by them, you attract and notice people with similar expectations instead of constantly having to justify your point of view to people who have differing values. Don’t forget, your life is a one-horse race. The only person you compete against is the best possible version of yourself. Comparing your standards to others’ wastes valuable time and energy. Their standards and way of living are not going to allow you to achieve your goals and objectives. 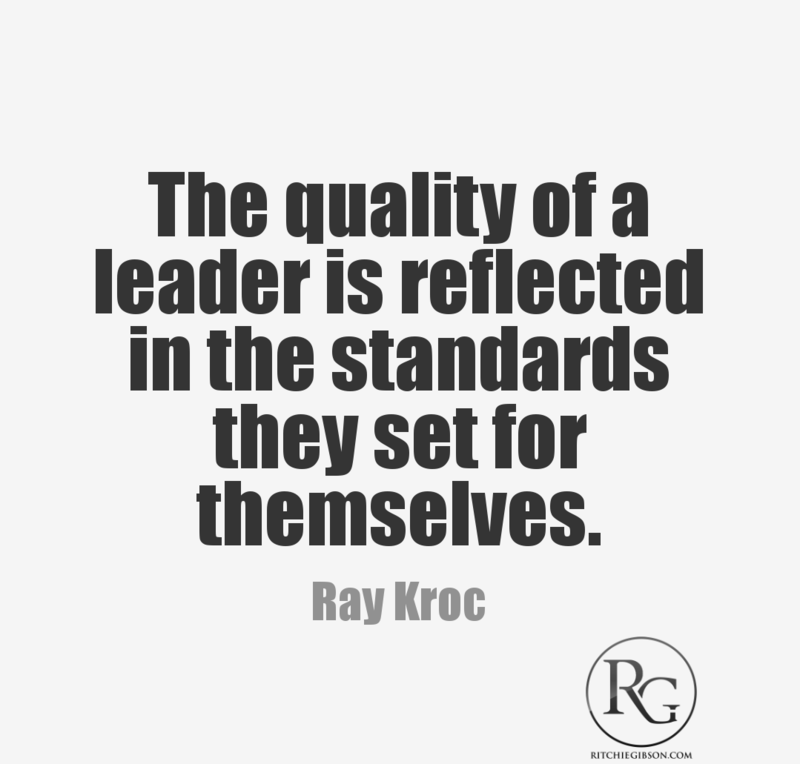 All too often, I find people lowering their standards to match those of their peer group so their peers feel better. If you have decided to have higher standards, then you cannot compare yourself to anyone else. By setting higher standards, you increase the probability of achieving what is possible. You demand more not only from yourself but also from the people around you as well. Most high performing teams I work with set rules and standards that each team member agrees to and are held accountable to. Because of this, you are prepared to go further, try harder to achieve the outcome you’re after – all of which increases your chances of achieving your goals, both individually and as a team. The standards you set will depend on the amount of work you’re willing to put in and the goals you wish to achieve. These two factors alone will dictate the foundations of the personal standards you live by. This week remember that only you can raise your standards. Doing so starts with first making a choice and identifying that things need to change. Pick an area in your life you wish to change and work on improving your standards in one aspect of your life at a time. Need help raising your standards? Starting July 1st, I am have allocated time to take on two new mentoring clients. If you are looking to start the back half of 2016 with someone in your corner, helping, guiding you and keeping you accountable, click the link below and contact me for further details.